It’s so simple; it may sound flippant. A sure-fire way to improve your recruiting success is to reduce the number of candidates you lose in the process. It’s not the only way, but it’s possibly the most effective. So, while we help companies do a better job of connecting with new candidates — applying the latest in sourcing strategy, social media, employer brand strategy, recruitment marketing and advanced technologies — we’re also in the business of keeping those candidates connected. Obviously, the idea of not losing candidates would seem like a study in process improvement, applicant tracking, interviewing and screening and selection. But that’s misleading, and a hazard of working in a field where many observers have compartmentalized best practices. In reality, keeping candidates engaged falls squarely into a strategic area that, to many, may not be so obvious. It is about the employer brand. Consider the facts. The path from being just another professional in the workforce, to a productive employee in your company, is a long one. This is the “candidate journey.” It is full of distractions, forks in the road, uphill stretches and places where the candidate can run off, say no or simply disappear. The only thing keeping the candidate on that path is an interest in working for your organization. That interest is based solely on how the candidate views your organization as a place to work, and shaping that perception is what employer brand is all about. 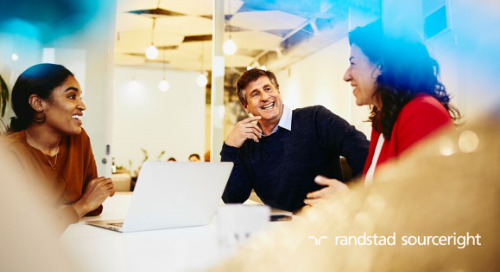 The recent 2016 Randstad Sourceright Talent Trends Report details the challenges around brand and the candidate experience. Of the business and talent decision-makers surveyed for the report, 58 percent rated the candidate experience at their organization as “good,” with a full third considering it at “just average or less.” Meanwhile, 74 percent have stated plans to “enhance the candidate experience over the next year,” and 45 percent are focused “a great deal more” on employer brand improvement compared to previous years. With that in mind, next time you consider your limited budget and resources in relation to the myriad of options available for improving your talent acquisition strategy, think of the candidate journey as a way to help you prioritize what to do. And in the same discussion, there is a very reliable way to look at how your brand experience is influencing the candidate journey. It begins with understanding two ideas that will shape every potential employee’s view of your organization: context and perception. If you are a leading retailer, you may be tempted to think that your consumer brand can stand on its own in attracting the talent you need. But what if that talent is IT-related, perhaps a developer to help you evolve your e-commerce site? And what if you are located in the same part of the state as big technology companies, such as Google or Apple? Suddenly, in the context of the competitors around you, your brand is no longer top dog in the eyes of the candidates you seek. That’s a simple example of context. Candidate perception goes right along with the story. What if you assumed that the same candidate was interested in flexible hours, virtual work arrangements, challenging projects and a strong sense of social responsibility — ideals we often associate with millennials who are likely to be associated with tech talent? Now, what if the skill you’re recruiting is less cutting edge, or perhaps you find yourself aiming at Baby Boomers, not Millennials — people whose top goals are not necessarily centered around working for top technology companies. These candidates are deciding not to apply, because they are more concerned about salary and stability than flexibility and virtual work — and word on the street is that there are better places for stable career paths, benefits and compensation. When a company knows the perceptions that drive the decisions of targeted candidates, it can do a better job of keeping them connected. How do you turn context and perception into a plan that can support a real strategy or investment in resources? One answer is to think about them as they relate to three areas influencing the candidate journey. That is, take some time to understand the candidate, to learn about your competitors and to examine your own processes. Candidate:You may find that you have to go through a dedicated assessment to understand your audience better than ever before. It is an effort to understand how your organization best relates to target candidates groups (i.e., Millennials), and then how you are set up to deliver the best experience to each candidate as an individual. How is your organization perceived by the candidate, based on their experience with you and your brand in the market? What are the ambitions and expectations of your candidates? How do you appear in context of those ambitions? These are critical questions that need to be answered before deciding on any brand or engagement strategy. Competitors:Your industry competitors may or may not be your talent competitors. The competitor may be a rival in your market, or it may be a completely unrelated organization that happens to need the same talent — or it may be simply another career option, such as starting their own business or going back to school full-time. By examining and understanding your candidate, you can then start to gain a better understanding of who, or what, that competition is. Consider the context: Do competing options make the strengths you offer irrelevant, or are you in a favorable position? Then consider perception. If you think your organization is the greatest place to work with the most open co-workers, but your competitor shows a kinder, more responsive side during the recruiting process, in the eyes of candidates you will lose that competitive battle. It’s up to you to make that right. Process:This is where your knowledge of both your target talent and your competitors can truly shed light on the candidate journey. Does your process of interacting with talent support their perception of a great opportunity? Does it help place working for your organization ahead of other competing options available? Look carefully at the process. Every interaction counts. Consider the time a potential candidate first hears about your organization, or their first visit to your career site. Consider their interaction with your employees, or the experience during the interview and final selection. A rude front desk person at the interview site can ruin the candidate experience, just as much as a bad Glassdoor review or a confusing application process. Each part of the journey — from attraction to engagement, through to selection and hire — offers its own “moments of truth” when the candidate can sow a seed of doubt or stop considering your organization entirely. It’s up to you to find those moments of truth and make sure they work for you, not against you. If you want to take a new angle on improving your talent acquisition performance, start by exploring your candidate journey first. No amount of new tools or resources can help you improve results until you know where and how the human interaction is working today between you and your candidates. That’s the perspective behind our emphasis on context and perception, and it’s the framework that can help you better understand your candidates, your competitors and the process that brings talent to your organization. The candidate journey is where a great talent strategy begins. Get it right, and you have a foundation for a strong employer brand and long-term talent success.